We got rid of cable TV in November of 2009. Since then, we’ve been watching over-the-air TV and zipping through our Netflix queue, as well as spending a lot more time participating in non-passive entertainment. This means we’re a lot healthier and less zombie-like. Of course, we still have internet connectivity so the cable company still gets a check from us every month– it’s just not as large as it used to be. I’ll say again that we don’t miss cable TV one bit: this was one of the smartest decisions we’ve made. For a long time, our primary media source was the Sony BDP-S370 Blu-Ray player, which has connectivity to Netflix, Amazon, and a few other online services. The player has generally served us well, but it comes up deficient in a couple areas, specifically its inability to talk to other devices on my home network, where I have other media files stored on a FreeNAS device. Sony claims the Blu-Ray player supports the DLNA standard, as does FreeNAS. The problem is that there doesn’t seem to be an absolute “standard” protocol so these two pieces of equipment don’t talk to each other, which I find aggravating and a nuisance. A few months ago, I read a review of the Western Digital WDTV Live Plus, a device that’s about the size of a McD’s Quarter Pounder box that plugs into your network and TV and, as you will learn if you Google it, will “play just about anything you can throw at it.” I picked one of these up through Newegg when a sweet coupon came through that made the deal irresistible. You can usually find this device for just under $100. In short, the WDTV Live Plus delivers exactly what it promises: not only does have access to several online media services, including Netflix and Amazon as well as a couple others including Blockbuster, but it immediately found my FreeNAS server on my network and all the files I have stored there– and it played most of them flawlessly. It can play movies, audio, and photos on your TV screen as long as they’re formatted in a way the box can understand, which is a pretty long list. Here’s a list of the online services currently supported on the device, and here are the complete specs showing the formats it can read. I typically use Handbrake to make iPod Touch-compatible movie files from the DVDs in my collection: this way I can watch movies on my commute without having to break out my computer on the train and running down my MacBook’s battery. Over the years I’ve ripped much of my collection and stored the files on my FreeNAS server. I also have a PC running SnapStream’s BeyondTV acting as a DVR to record over-the-air programming, which I store on the FreeNAS server: the WD Live plays these all files on my TV just fine. The device also understands VIDEO_TS files: this means I can use a program like RipIt on DVDs that I own to pull the DVD contents to my computer, then copy those files to my server. When I want to watch the movie, I go to the file on the server and click– and the entire DVD’s contents, including special features, commentaries, etc., are all available to me as if I put a DVD in the player. This came in really handy recently when I was recovering from surgery and wasn’t supposed to move a lot: I hooked the WDTV to the bedroom TV and ripped a bunch of movies from my collection that I’d been meaning to watch. Those, along with what was available from Netflix and Amazon kept me entertained for those few days. I should also mention that two other features I enjoy are a page that’s connected to AccuWeather that gives the current conditions and 5-day forecast, and an interface to TuneIn Radio, which happens to be my favorite streaming-radio web site and iPod Touch app. This latter feature allowed me to get the latest news from WBBM and WBEZ as well as checking in on Kermode and Mayo on BBC 5 Live, right from my TV. 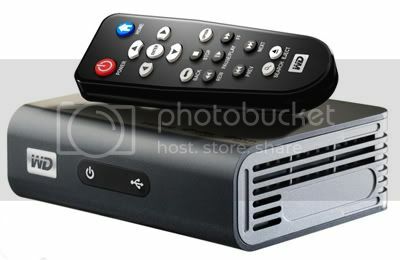 In addition to accessing media on the Internet and a local network, you can also attach a flash key or portable hard drive to the unit’s USB port: this not only allows access to the media, but it turns your WDTV device into a media server for your network, meaning you can play movies and music from the WDTV on your computer. When playing music or photos, it doesn’t use as elegant an interface as Apple’s iTunes or iPhoto: you have to navigate to the appropriate directory to play or show the media you want. This is where something like an AppleTV has an advantage, but it’s not a deal-breaker for me. Some people who know I’m an Apple fan asked why I didn’t just go for an AppleTV. While the AppleTV interface is nice and intuitive, the main reason is that I wanted to break out of the Apple/iTunes ecosystem: with the AppleTV you can only watch or listen to what you have in your iTunes library. This means that if I wanted to watch something that’s not available in the iTunes Store or on Netflix– I’ll use Jim Jarmusch’s wonderful 1991 movie Night on Earth as an example- I would still have to get the DVD off the shelf and put it in the player. This in itself is not a big deal, but if my goal is to simplify how I access my media, it seems more directionally correct to have a media player that is flexible, which the AppleTV doesn’t seem to be. I recently looked at some of the newer boxes by Roku, but it seems they’re lacking in the ability to use a local network for source material as well. There are several other, cheaper boxes out there that seem to come close, but none of them have the feature set of the WDTV Live Plus. For now, I’m very happy with the WDTV Live Plus as an internet media hub– and I’m hoping for its continued success to keep the competition trying to come up with something even better, since we’ll all win!